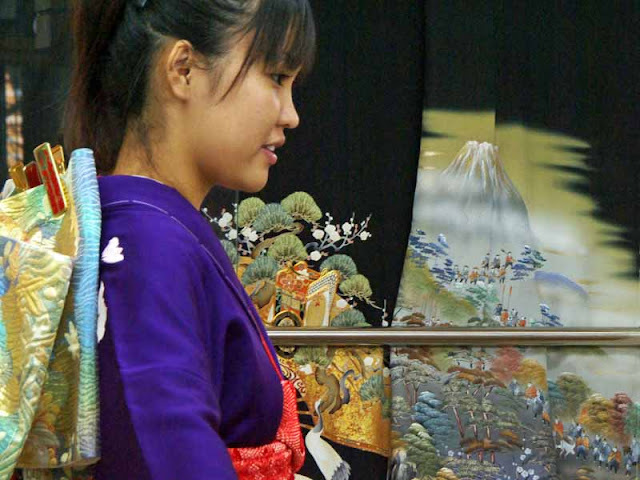 This Monday January 10, 2011 will be a National Holiday in Japan. Sejin No Hi (Coming of Age Day) is a big event in Japanese culture. It is to celebrate turning the ripe old age of Twenty ! In Japan 20 year-olds are considered adults. That means they can drink alcohol, smoke cigarettes, sign contracts and vote in elections. It's a big deal so, everybody gets dressed up for the event. Years ago, boys came of age at 15 and the girls at 13. The boys would get a haircut for the event. And, the girls would paint their teeth BLACK ! Well, times have changed for the better, I think. Since 1876 the laws have been modified in Japan. You have to be 20 years old to be considered an adult and girls don't wear blackened teeth anymore. They wear pretty kimonos for Coming of Age Day and they don't have to be be so ugly. The photo above was taken in September of 2008. To give you an idea how serious folks are about preparing for Sejin No Hi, this gal was getting fitted for a kimono months in advance. The event doesn't take place until the second week of January. Knowing she was a minor at the time, I couldn't legally take her picture without the consent of her adult, legal guadian. So, I went over to her mother, sitting in a chair watching her daughter getting all decked out in this kimono. I spoke to her in the Okinawan dialect and got her laughing. I told her she had pretty eyes, hah ! Not only did she sign a release, she gave me permission to have the photo published, too. So, that's what I did at BootsNall Travel Articles. You can read more about Coming of Age Day in Japan in the JAPAN UPDATE if you like. I have to clean my cameras and practice stretching the truth, a bit, in Japanese so I can get more photos of pretty young girls in their kimonos ! Is there anything like the Coming of Age Day in Japan in your culture ?